A sturdy, Asian-made bicycle is a game changer for many recipients. Without a bicycle, Gospel for Asia-supported missionaries often have to walk many hours a day to visit various communities for ministry. Similarly, many school children walk several miles to school, which can exhaust them and hinder them in their studies. Many breadwinners also have no mode of transportation, so they struggle to find jobs within walking distance or to carry their wares to market. With your help, traveling from one village to another doesn't have to be a tremendous burden. A bicycle bridges the gap between villages, keeping its owner from spending hours walking to and from church activities, school, jobs or people needing prayer. For missionaries in Asia, a bicycle is a tool that dramatically increases their productivity and consistency in ministry. Similarly, a bicycle given to poor families gives them new job opportunities and helps their children go to school. 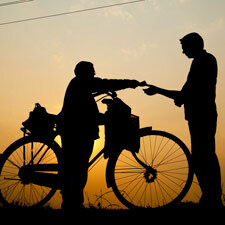 When you raise funds for bicycles, you help missionaries, children and laborers go farther, faster. Bicycles are easy to repair, making travel consistent and practical. Bicycles offer reliable transportation with little cost. By raising funds for bicycles—only $110 each—you will equip pastors and families with game changers. Motivate your team to transform numerous lives, all with the help of this simple, inexpensive tool: the bicycle!